Wow. This author is wacko! Absolute bunk. 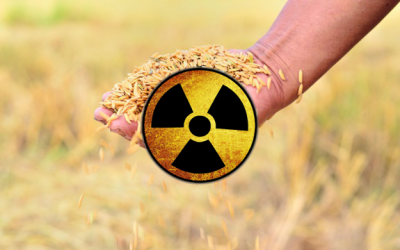 ” …do they (Japanese) really want to eat radioactive rice? The government of Japan seems not to care.” Every last bit of food eaten in the world has naturally occurring radioactive isotopes in it…every breath we take…every drop of water we drink…all naturally radioactive. Should we all worry about it? The quoted blurb defies reality and promotes radiophobic psychological damage. Be real, or be silent. “Radiophobic psychological damage?” What a ridiculous load of ignorant crap – or purposeful misdirection. Anyone able to put together such a facile statement should be smart enough to know that of COURSE the entire Earth and everything on and in it has background radiation – and that the key word in that sentence is “background.” Background radiation, over the long haul of evolutionary changes, assists genetic diversity by altering RNA with very small changes, which are then environmentally tested as an assistive adaptive trait, increasing species survivability – or a dead end, leading to non-survivability or a branching of the species, leaving the line lacking the trait to remain essentially stagnant. This is the process of slow, nature-tested mutational changes. But are you actually stating – and BELIEVING – that rice grown in a field that has been exposed to incredibly high levels of radiation from multiple nuclear reactors melting down, and releasing thousands of times the normal levels of radiation by smoke, drifting radiation carried by wind, and rain, with varying half-life periods, (from days to hundreds of thousands of years), is the same as eating rice from a field with normal levels of background radiation? The ground, the atmosphere, the ground water, the rice itself – can be lethal or lead to mutations so fast that they can’t be tested for survivability: tumors, internally and externally, scrambled RNA and DNA, with so many variations that the organisms exposed to this poisoned environment simply shut down – become sterile, have stillborn offspring, huge, twisted limbs and distorted faces, missing or additional limbs – have you ever looked at the children who were in the area surrounding Chernobyl? Many of them are hardly recognizeable as human. Too many genetic changes, too quickly. The rice itself, under these conditions, will not be “normal” rice – it will contain massive levels of accumulated radiation, and will be subject to the same twisted changes any other organism is under long-term exposure to hard radiation (as opposed to background radiation): sterility, and a host of re-written changes in its cellular structures – and none for the better. You speak like a person who thinks a little sun is good for the body, so it would be even better to strip and lie down for weeks – or until your skin bakes off as boils and tumors. Yes – we should all worry about that. There is – as you must well know, an ENORMOUS difference between a little background radiation, and the fall-out from a nuclear power complex with multiply melting cores, spewing unmeasurable levels of the entire spectrum of lethal radiation into the air, onto the ground, and into the ocean, continuously – and with no end in sight. I’ll tell you what – YOU eat it, and I’ll wish you well while you live. “Radiophobic psychological damage?” It won’t be anything but a pack of really stupid words, or purposely spoken lies, when you start throwing up and your hair falls out in clumps, as you bleed from every orifice. The quoted blurb does not defy reality – it defines reality, in a highly radioactive environment. In addition to the children born around Chernobyl, you might want to look at some of the children STILL being born around Hiroshima and Nagasaki with radiation-driven, horrible mutations. And since it re-writes the RNA, and hence the DNA, the changes are permanent – carried from one barely surviving generation of a family to the next. You either have no real information on the effects of very high to lethal doses of radiation , or so much information that you are simply a shill. Either way, you are a fool. There’s no argument here – just the simple truth: any rice or other crop grown within the huge, affected area around this plant is as poisonous as the water, the soil and every dust-particle you breathe there. There are, in life, some things to truly fear. Death by radiation is really high on that list. I am, for the record, not anti-nuclear power. But this situation is as about as dangerous as it gets, and pretending it’s o.k. so people don’t get ‘psychologically damaged” is like telling everyone in the car to calm down and relax as it plunges off a cliff, so they won’t be traumatized when they hit the ground a thousand feet below. Be real, or be dead. See http://www.hiroshimasyndrome.com/radiation-the-no-safe-level-myth.html for background on the realities of radiation, and http://radiationeffects.org/ for the most authoritative information anywhere on radiation exposure. It is sad that you suffer so horribly from radiophobia. But, am I a fool? No. I’m an expert on radiation and its biological effects. I’m a former health physics professional and have remained “in the know” for more than 30 years. You can either choose to learn the truth, or continue to resort to ignorant name-calling and needless fears. The public may be opposed, but they are not bought and paid for by Monsanto. Gosh, it sounds like home in the USA. Arsenic rice grown in old pesticide laden cotton fields has been kept quite of late, and is allowed to be use for sale to the public; even for use in baby rice cereals. Marie Antoinette just said,”let them eat cake”, and she got the guillotine for it. Hmm? !